I realized that in some of my previous posts, I've needed to clearly explain spinal flexion and spinal extension, and define what I mean by the "slump" of poor posture on the bike. First thing first, neither spinal extension nor flexion is inherently bad. These are just a few of the natural positions our spine and core (more on that another day) are designed to perform in the course of the day. The challenge is not simply the position, but the frequency with which the body adopts the position. (Other spinal movements include lateral flexion/extension and rotation). The image on the left shows a traditional spinal flexion, in which the vertebral bodies are getting closer to one another. The image on the right shows spinal extension, in which the back part of the spine, or spinous processes, are getting closer to one another. Flexion, as a direction of motion term, means to decrease the angle in the joint or the two parts. You flex a bicep, you shorten that muscle, you decrease the angle of the elbow joint, meaning forearm approaches shoulder. You flex your knee, you draw the bones of the thigh bone and shins (femur-tibia/fibula) closer together. Extension refers to an increase of the angle in the joint or body part, so extending the bicep is drawing the hand away from the shoulder, bringing the arm to straight, lengthening the muscles of the upper arms. This is a traditional yoga pose called cat pose, Image courtesy of Yoga Journal. In terms of the spine, spinal flexion is an action we perform when we typically do sit-ups or if you're a yoga person, many arm balances such as crow (bakasana), cat pose, and many forward folds. If we think of flexion are closing down the joint or decreasing the angle of the joints (vertebrae), then flexion is bring the vertebrae closer to each other. In many contexts, spinal flexion is also coupled with a posterior tilt of the pelvis, or a "tuck" of the pelvis. In cat pose, the pelvis and spine (and neck) are all moving in tandem. In cow pose, both the hips and spine move together, putting the hips into an anterior tilt and the spine into extension. Spinal extension is something we want to do when we pick up heavy things, i.e., dead lifting, squatting with weights, helping someone move, etc. It's also a large part of yoga asana in the category of backbends. As a term, it's expanding the distance between the vertebrae, which is why backbends can feel really good at the end of a long day of playing or driving, when we've compressed our vertebrae. Pelvic tilt, which I've mentioned on many occasions before, just as a refresher. So in our day to day lives, we want both of these actions in our spine and pelvis. The problem is that most of us sit for many hours a day, and we sit in spinal flexion, coupled with a pelvic tuck (posterior tilt). This means that we're spending let's say, 6 or so hours in flexion a day. So when we choose our "exercise" or other movement activities, they can compound that flexion tendency, or undo it. 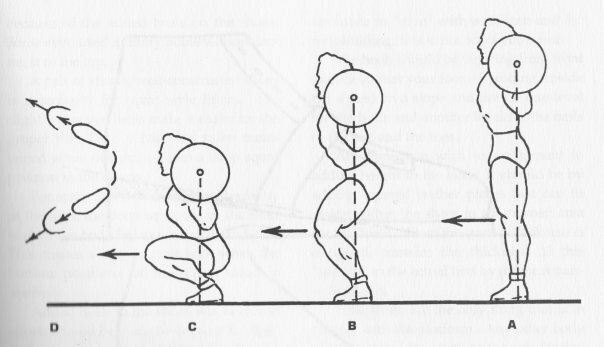 Quickie chart on pelvic tuck and biking. See how posterior pelvic tuck brings the vertebrae closer together on the right? Even if you have good pelvic form on the left, your spine is in flexion. It's just how it goes. So back to biking. Biking is an activity that inherently puts you into spinal flexion, and often into posterior pelvic tilt, because of the various factors at play, including how the weight is pitched forward, the height of the seat, the height of the handles, the type of bike, etc. If you have a super upright cruiser bike, you won't be pitched far forward, whereas if you are training for an ironman and have a fancy racing bike (and have one of those crazy helmets), you'll be in super spinal flexion, even if you have good pelvic alignment. My hope is that everyone can find a good pelvic alignment on the bike, and that we can look at our other movement patterns in daily life to undo that spinal flexion patterning. If you know that you bike a lot and sit a lot, start to pay more attention to how you sit, how often you sit, and what is happening in your hips and spine as you do so. 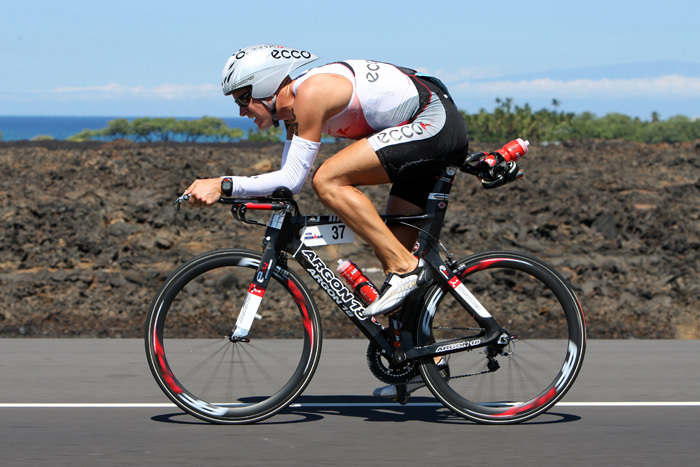 This is an image from the 2007 Ironman World Championships, featuring Denmark's Torbjørn Sindballe. I obviously have no knowledge of ironman training, but I can see that he has fairly decent pelvic form, but has to go into serious spinal flexion because the handles are low (and add to that neck extension, i.e. nose and gaze up while spine orients down). This means he can go super fast, but I just hope he has a good bodyworker for when he's done!